Yes! Even the holidays can and should be organized. There is definitely an art to hosting a dinner party and my goal is to share some of my tips with you so that you can avoid some of the mistakes that I have made in the past. 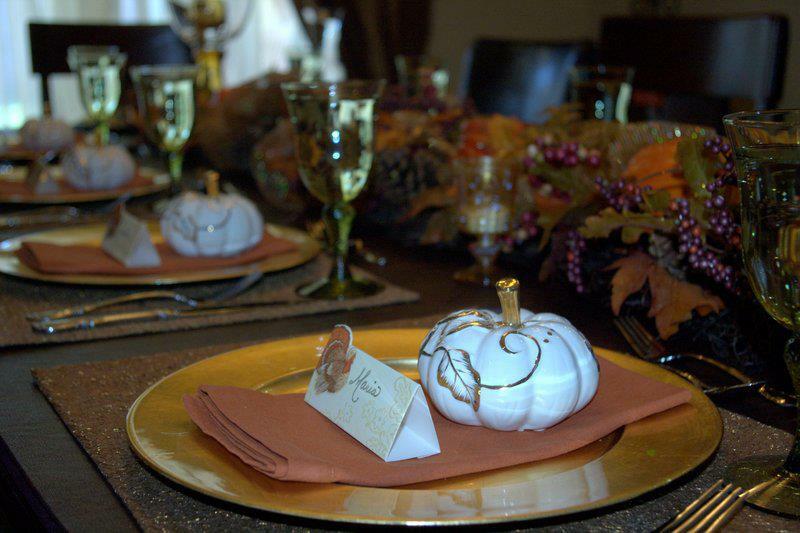 These are general dinner party tips but you can definitely use them for Thanksgiving. 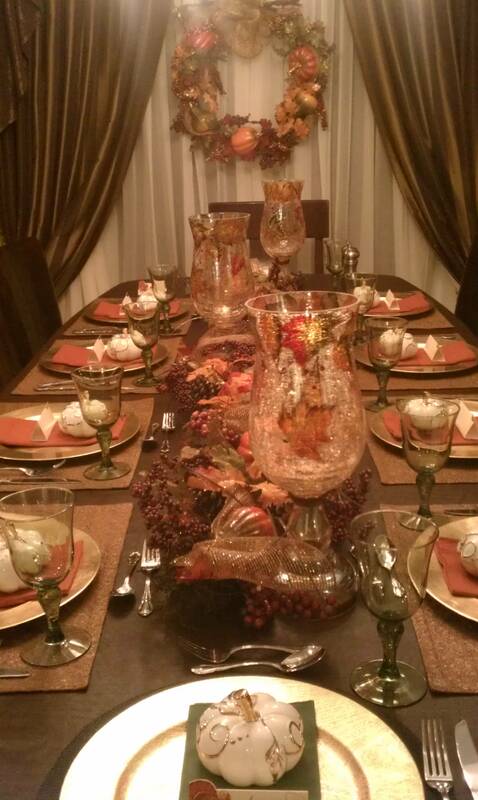 Our Thanksgiving table last year. I buy items right after the holiday is over so that I can decorate the following year to my heart and wallets content! Have you ever had a dinner party that 30 minutes before your guests arrive you are still running around like a chicken turkey with your head cut off? The moment they arrive everything is done and you think to yourself…”if you only knew how crazy my day has been in order to pull this off!” Basically, they are ready to start having fun and you are ready for a nap! Situations like this make us want to avoid having people over. It’s a shame to avoid dinner parties altogether considering that when we move into a home, when we buy new dishes…we think of entertaining. We think of well orchestrated dinner parties. In my case, I love to entertain and have dinner parties. I have had great and not-so-great dinner parties and I can tell you that planning makes the difference! The ones that were not so great had nothing to do with the people I invited. I was just simply too exhausted to enjoy what I had worked hard to put together. Nowadays, although I have small kids and I can’t entertain as often as I would like, I still have dinner parties. And…. I plan. I plan EVERYTHING. I have a timeline of when things need to get done. I even write down when to turn on the candles, when to start playing the music…those are the little things that you can easily forget to do until after the guests arrive. Those are the things that really set the ambiance for your party. Whether you like to be really fancy or really laid back, a list will make all your gatherings more enjoyable. Whether its paper plates or fine china, a list will keep you on track and relaxed. These little ceramic pumpkins were about 1.00 each on clearance. I had to wait a whole year to use them but I loved the result! The point of the to-do list is not to stress you out or to try to impress anyone with “the perfect dinner party”. The point of the list is to help you relax and know that everything is on schedule and that you don’t need to be anxious about anything that you may be forgetting because everything is written down and accounted for. The point of a dinner party is to have fun and to entertain but that is impossible if by the time that guests arrive you are so tired that you are counting the minutes until they leave and you can take off your shoes. The truth is that even with a schedule, things happen. Food can burn, overcook, things can spill. However, these events are much less overwhelming when you have a schedule. 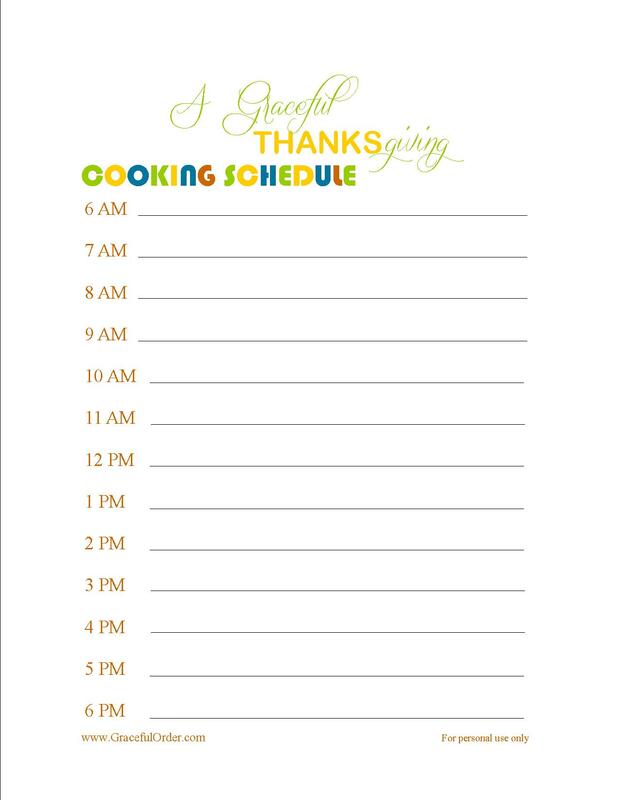 So with Thanksgiving around the corner, I wanted to share some printables with you to help make this dinner party go as smoothly as possible. Let’s face it, Thanksgiving is the mother of all dinner parties! There are so many dishes to keep track of that without a schedule I would not be able to pull it off AND have fun. 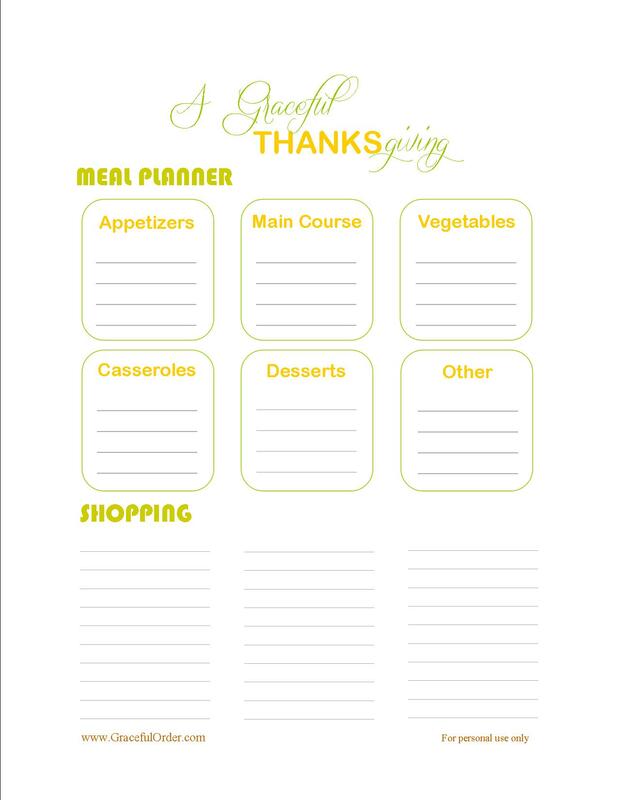 Even if you decide not to do a list for all your dinner parties, consider doing one for thanksgiving. Setting the table one to two days before a dinner party. Make ahead anything that can be so that you can check it off your list. If a dish cannot be made ahead then perhaps do the chopping and prep-work ahead of time. Take out all your servewear so that you can have all the platters handy on the day of the dinner party. 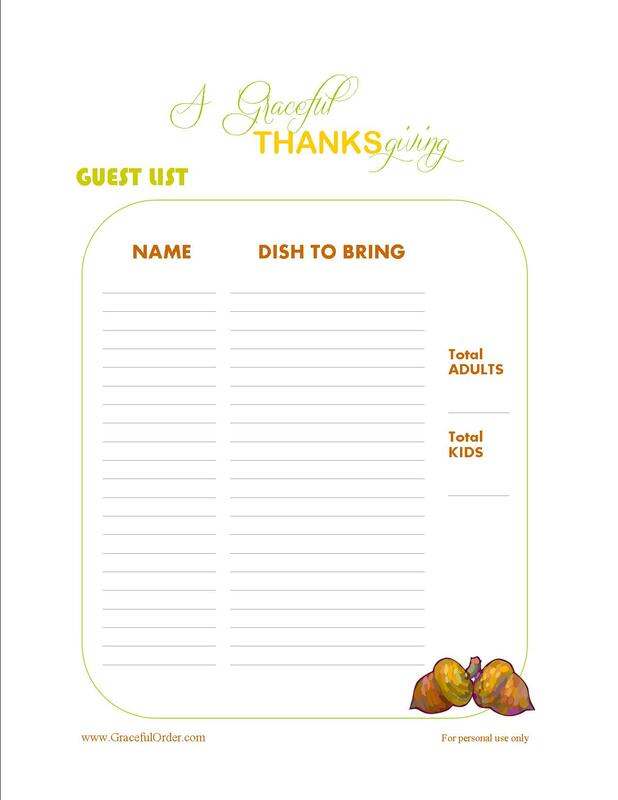 Print out or make copies of all the recipes you are using so that you can staple them together and have them handy on the day of the event. Set up your coffee maker ahead of time so that you don’t have to fuss with it when your guests are there. Just press a button and you can join your party once more. Set up a coffee station or a platter with coffee cups, sugar, creamer and stirrers so that you can just bring the pot to the table along with all the necessities. Have a couple of music playlists that you can play during parties. A more soothing one for the dinner portion and a livelier one for later. Try to wash dishes as you go to lessen the clean up later. Empty your dishwasher so that you can fill it up after your dinner party is over. The most important TIP is that you have fun. I love lists but the list goes out the window the moment that my guests arrive. It’s all about them at that point and about enjoying myself with them. Your guests will feel it if you are stressed out, so relax. If you are relaxed then they are relaxed. If something burns, just move on…laugh about it. No one really ever remembers what they ate or the table linen that was used…they remember how they felt. People remember having fun, good conversation. In the end, the list was never to assure that they had fun. It was to assure that you could have fun with them. Here you can find the lists that I made on JPEG format. I hope they make your holiday a more enjoyable one! Remember: Do as much as you can before your guests arrive but when they do (regardless of what still hasn’t been crossed off your list) throw this list away and just have fun! With that being said, Have a Happy Thanksgiving and count all your blessings. There are many. You can make a list about that too! Yes! Such a great idea! Homemade Ravioli…YUM! !